The day before my first half marathon was terrifying. Runners were invited to a pasta dinner at a nearby church after we picked up our race packets at the Expo, which was an awesome and delicious way to kick off the weekend. I was not expecting the entire second floor of the Niagara Convention Center to be filled with things to look at or buy. There were “discounts” on athletic gear ($45 for compression socks still doesn’t feel much like a deal…. ), and vendors there selling pain relief creams and granola bars. After the expo and pasta dinner, I didn’t do anything, even though I felt like I should have been. All I could do was watch TV, drink water, and go to bed early. I could hardly sleep, anxious about my 5:15am wake up. What am I forgetting? What do I need to do? Should I wear a sweater? What should I eat? It all was becoming pretty real. Then there’s the “what do I eat” part. The race started at 7am, meaning that departure time was 6:15 or so. Finding the balance of eating enough but not feeling over-stuffed was quite the challenge. Mental note that peanut butter on a bagel and a banana isn’t quite enough. After maneuvering parking and walking to the convention center, the nerves really started to kick in. It was real. 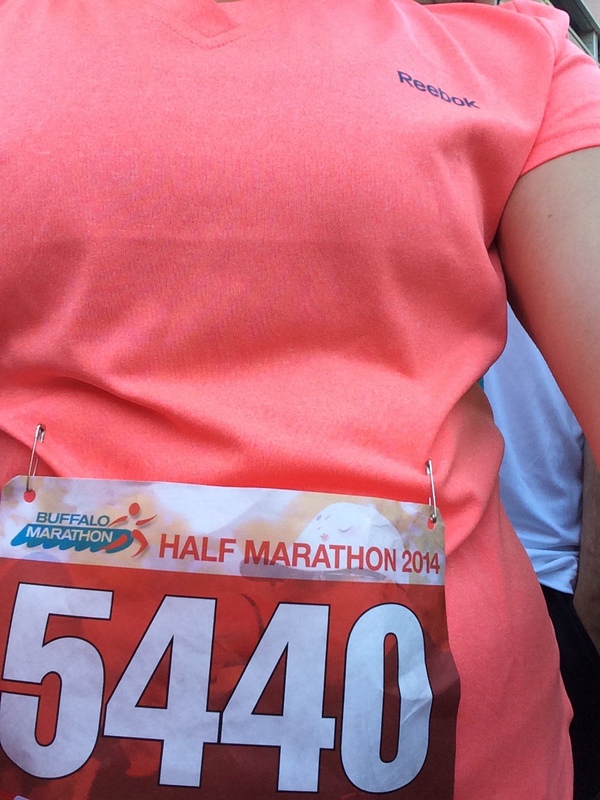 I was at the Buffalo Marathon and about to run my first half. I didn’t know what to expect, considering I had to ice my shins and knees the day before to numb the pain. I lined up next to the 2:30 pacer anticipating I would have to walk, despite my pace was about 10:30 in my training. We kicked off at 7am and naturally my shins and knees started to hurt. I was in pain for somewhere around the first three miles, dreading having to force myself to walk another ten. I had to remind myself that there was no shame in walking, especially if it meant walk or seriously injure myself. Even though I kept reminding myself of that, it was normally countered with “well, if I run it will all be over faster” or “see how you feel in a half mile.” Probably not the best strategy. The weather was amazing and the course was awesome. Sun was shining but not too bright that I had to squint, and the breeze was just gentle enough at my face that it cooled me off but didn’t feel like a battle. The route was very flat, with two small hills that were easy to run up. I was also excited to run around downtown Buffalo. Growing up in Williamsville, I knew a few small areas of the city, but I was given the chance to take a 2 hour tour of my home city. We passed the waterfront and residential areas, and even though I never really knew where I was, I was always entertained by seeing new sights, and hearing live music by local bands throughout the course. The entire run I reminded myself that this was a test of mental strength too. It’s easy enough to run/walk the race (well, not SUPER easy), but I wanted to be satisfied crossing the finish line. We ran well over half of the race without walking, something to be happy about. Overall, we walked under a mile and a half. Not bad for my first half marathon. After walking a full mile from 10.5 to 11.5, the end was near. It was mind blowing. I had to run less than 2 miles to finish my first half marathon. I could hardly believe myself. My legs felt like blocks of concrete, and I could really feel how much it took to run. This was the actual test of mental strength…and physical. I don’t really know what I was thinking as I saw the finish line off in the distance. Mostly just ow ow ow ow legs ow ow ow oh my gosh why is it so far away go go go but I got to the end. My clock said 2:31, and theirs said 2:34. I’ll take it. Then it was over. That was it. I finished 13.1 and it was awesome. We were given Buffal0-shaped medals from Buffalo Bills and Ms. Buffalo, got my picture taken to prove it’s legit, and couldn’t stop smiling, despite how much pain I was in. It hurt more to walk than run, crazy. I was exhausted, but my shin pain was gone. Everything was sore but nothing was excruciating, and I wasn’t sure if it was because I had to push through the pain, or I injured myself so badly that everything went numb. Remember how I said running really isn’t that healthy? We celebrated with pizza, beer, apples, bananas, yogurt, Mighty Taco, Paula’s Doughnuts, and more alcohol. The rest of the day we sported our thirteen.one shirts and medals, because when else can you get away with wearing a medal in public? The entire day I continued to remind myself what I just accomplished and how far I really had come. Less than a year ago I had run my first 5K. I was just as terrified about that as I was before this half marathon. The journey was full of happy and sad moments, but I did it. I do need to take the time to thank every single person who had and continue to support me on this journey. It would take much too much time for me to thank everyone individually in this blog post, but you know who you are. And even if you don’t think you did, you probably did. The people that I’ve complained to about pain, called or texted after a bad run, supported me financially to be able to afford all the crazy equipment, high-fived me after a good run, signed up for 5Ks with me, told me that I should go on a run even though I didn’t want to, told me not to go on a run when I didn’t want to, advised me to rest my body, asked me how my training was going, told me that they’re impressed with my goals, ran half marathons and became my inspiration, given me hugs and told me it was going to be ok, even liked my statuses on Facebook; all of you have been the reason I’ve gotten to this point. Thank you. Congratulations! That is really exciting. Do you think you’ll run another one? I will be! I am already registered to run the Wine and Dine Half Marathon in Walt Disney World in Florida on November 8!